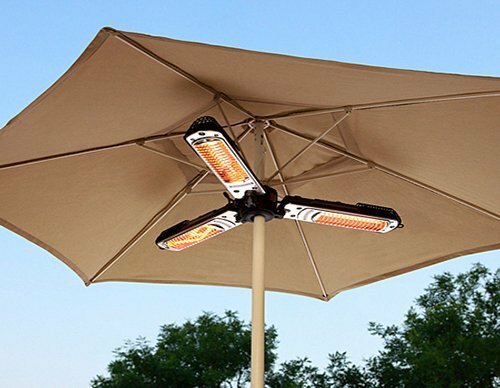 There are a few things ewe noticed when we started looking at the AZ electric parasol patio heater. Az is well known brand in the patio heater business. 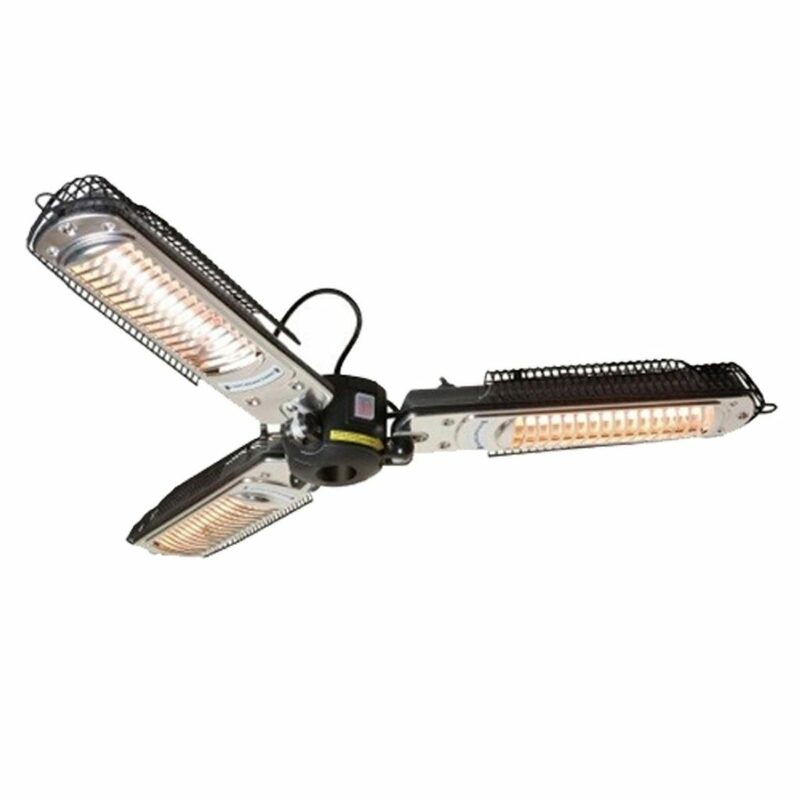 This one comes with a variable temperature controller and a variable attachment option for your umbrella pole. The specs mention that it will heat up about 15 square feet in radius of space and that is about what you need around a patio table. 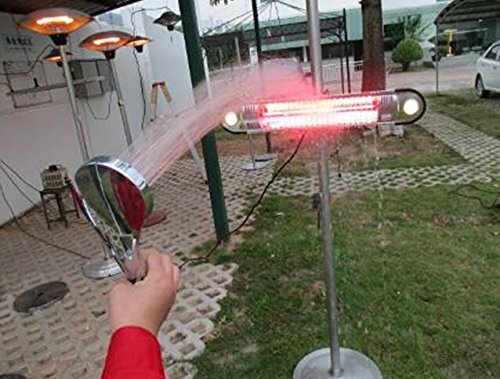 This umbrella patio heater measures 6 x 40 x 40 inches and the weight is 10.6 pounds. Light enough to be attached to any patio parasol. With an average of 4 out of 5 stars most customers are pretty satisfied with this electric patio heater. 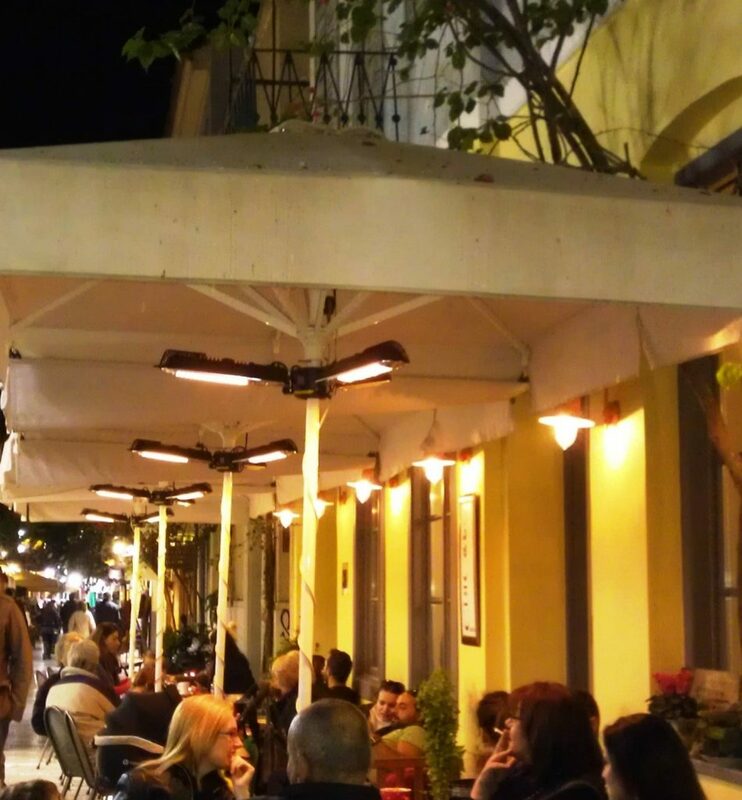 Like we have mentioned in all our other reviews of patio heaters there are people who expect this heater to keep them warm on a cold winter night. That is not what these type of heaters will do. They are made for cooler nights and will not keep you warm on a winter night in the norther states. Many people mention that it works good for temperatures between 40 and 60 degrees. Lower temperatures probably depends on other factors like wind. There were a few people who installed it under the table to keep their feet warm. The overall opinion about the quality and sturdiness is good and no complaints about that. The cord is about 6 feet long so an extension cord might be a necessity depending on you situation. Try to find a quality extension cord. We will show and talk more about it later. The amount of electricity used is very low. with an average of 20 cents per kilowatt this unit will cost you about 30 cent per hour on full capacity. According to someone it is cheaper than propane gas patio heaters they had used. The rating of 4.0 stars is in my opinion a little low and was influenced by the people who rated it low because of the heat output. They were expecting it to keep them warm on a cold winter-night and like we discussed that is not the purpose of a patio heater. This patio heater can be used on just a pole if you use the right diameter. I even read that someone used them as a ceiling heater in their covered patio without any problem. I guess it is just how you would like to use them and it seems not to be limited to a patio umbrella. It is comparable with the Fire Sense Electric patio heater we reviewed. A nice side effect is that it also seem to give of a lot of light and eliminates the use of a light on the patio table. The thickness of the plug was a problem for some people to get it through the hole in the table. Maybe removing the umbrella and than putting the plug through the hole will make it easier. Taking the heater down after using it to fold down the umbrella is very time consuming and a problem for some people. There are umbrellas that does not fold down over the heater and sty open a little. Maybe a larger umbrella cover will be a solution for this. Overall we think that this umbrella patio heater will work great on nights with moderate temperatures and will not work to well under 40 degrees unless inside or on a screened in porch. Just a reminder that we have not calculated the gauge needed for this 1500 Watts patio heater. It was recommended in the reviews we found. 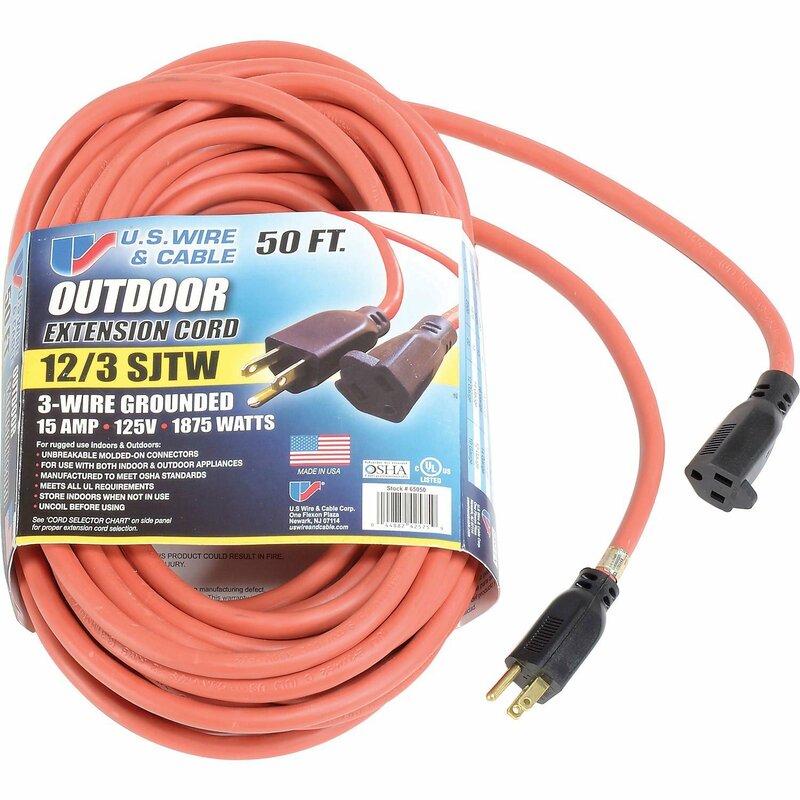 Click here to see the price of this 12 gauge, 15 Amp, 1850 Watts, 50 feet outdoor extension cord. 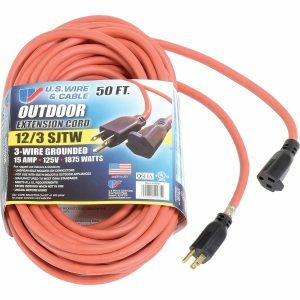 This extension cord was recommended by a person in the reviews we read about the 1500 Watts electric patio heaters.